I was surfing around the internet yesterday (as I do) for inspiration for the next blog and I came across a debate on "Organic food is marketing hype". Naturally, being into organic food I clicked the link and proceeded to watch the most interesting debate I'd see for quite some time. Now this particular video is about ½ an hour long……needless to say I did press the pause button once in order to get a cup of coffee and another time to go to the bathroom - but I digress. For those of you who haven't got the time, can't be bothered or aren't really that interested - here's a quick overview. An English guy, John Krebs who was the chairman of Britain's Food Standards Agency (their version of the FDA). A farmer (the only one), Blake Hurst who grew corn, soy beans and flowers (obviously not organic), he's also a writer. Last was Denis Avery, director of Hudson Institute for global food issues and who also writes extensively on food policies. First a lady, couldn't catch her name, but she is the director of technical policy for the consumer's union whose specialty is labeling especially the organic labeling. In other words she educates the public on what is organic and what it means. She was an excellent speaker and managed to refute the opposition's arguments with ease. Next was Jeffery Steingarten who is a food critic and writer - author of the book "The Man Who Ate Everything" (wouldn't mind reading that one). Last on this team was Charles Benbrook the chief scientist at the Organic Center - this center produces science with the goal of persuading us all to go organic. He, also was great. (I hope I've got all the names correct). I'm not about to tell you all their arguments, but needless to say it certainly raised some very interesting discussion. The funny part was that team one definitely showed their contempt for organic farming. The opposing team, on the other hand, tried to stick very close to the actual subject saying that is wasn't marketing hype and presented very good evidence in support. All sorts of things were raised from whether it's healthier to the actual farming practice of organics - why it is expensive to the environmental impact as well as whether organics could feed the world. Not to mention the pig poo! 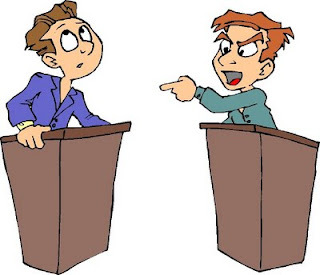 At the end of the debate the moderator said that it was "different to other debates we've had" - "it was spirited and interesting" which, I must admit, it was. Certainly neither side would have changed their view! Those for the motion = 21% - so they obviously hadn't changed their minds. Those against the motion = 69% - go organics!!!! I've put the video here if you do have the time (and are into watching debates) then I hope you enjoy. Every week in the supermarket when I see the organic bananas next to the Chiquita bananas I have a similar debate with myself. Usually I go with whichever seems more affordable, and that's usually the non-organic item. In this weather, when I can walk out and pick supper off the vine, I enjoy the bejeebers out of it. Would that I had the time to can and freeze and save all the bounty that's popping out now . . . to tide me over the long, long, cold, cold winter. I know how you feel with having to choose foods because of price, however, it's really great that you are able to enjoy your bounty...shame you can't freeze or can, maybe you can "give away" and get returns in the winter??? Thanks for the post. I'm sorry organic people, but food is never organic unless u grow it yourself. In this day and age there are so many things that are not what they seem, but even if you are right I'm sure that "organic" food is closer to the way nature intended than non-organic....well the commercial organic growers I know certainly strive for that - of course, now days even the seeds are dodgy. Thanks for your post.